So....this is going to be a totally honest, transparent look at my thought processes as I click on follow buttons (or don't) around the Internet. I don't think anything I'm about to say will be mean. It's just....well....honest. Take it for what it is, though: just one girl's way of picking and choosing who she wants to keep up with via social media. When I first started putting myself out there as a blogger I didn't want to mingle my personal stuff in with it. I don't care anymore, though....especially because Pages have so many algorithm restrictions now. Not to mention the fact that I am a "Personal Lifestyle Blogger". If I had a tighter niche, like food or crafts, I might continue to keep things separate. But I don't know. So yeah, I am friends with other bloggers on my personal Facebook. I will friend a fellow blogger if we've had some sort of other interaction first. Like we've tweeted with each other, or they've liked my blog page and maybe commented....or something. I'm still not super comfortable with getting a friend request from someone I've never interacted with before. I will say this about my fellow bloggers: they are some of the best people to interact with online. They say the nicest, most helpful (and funny) things. I don't think another blogger has ever ticked me off on my Facebook. Not always the case with people I know IRL. Just sayin'. Ah, Facebook pages....are a huge source of frustration for us lowly bloggers. The new algorithms zuck (yes I purposely used a z). If you have a page, you know what I'm talking about. Because of this, I have become quite liberal with my Likes. I am using my interest lists and you should too! I was once choosy about which pages I would like, but now I'm almost on a mission to thwart the powers that be in Facebook Land and get my Homies some exposure, dammit! I figure it's also good bloggy karma. For me so far, G+ is all about blogging connections. My biggest "circle" consists of other bloggers. I will pretty indiscriminately put any and all bloggers in this circle. It's worked out this way because none of my IRL friends are using G+. I will absolutely take a peek at the photos someone has 'grammed before I elect to follow them. I do. I'm not interested in too many selfies, too much text or only photos of your kids. Of course some of that is great, but there's more to life, people. You gotta mix it up! I want variety in the pictures I'm perusing. Pinterest is an interesting one for me. I have an account and I pin things to my boards. I even have a few very specific boards. I elected to convert my original account to a business one (as a blogger) because I don't actually use Pinterest in all that personal of a way. And again, I blog about my LIFE, so it kind of all mixes up anyway. Confession: I don't spend much time on Pinterest. I don't go there like I do Facebook or Twitter and just look at what people are pinning and repin my guts out. I will, however, go in search of something there on occasion, and I have been known to refer to a recipe or something else I've pinned. But in all honesty, I mostly use Pinterest for others' benefit. Do you know what I mean? I pin things that people who really do like Pinterest might like to see. And of course, I see the value in pinnable images in my blog posts. Therefor, I'm pretty indiscriminate in who I will follow on Pinterest, as it kind of doesn't really matter to me. Is that terrible? I don't think it is because all anyone should care about, is that I clicked follow, right? Twitter is where I'm the choosiest. This is because it is a fast-paced environment and it can get pretty overwhelming as the tweets stream by. I need to have some good reason to follow someone on Twitter. I get the impression the person will be funny. I get the impression the person will be helpful or inspirational. I see in the bio that we have something in common. A company, brand or organization I'm interested in. A celebrity I'm a big fan of. A blogging or social media resource. Sometimes I will follow for a giveaway entry, but it's gotta be a really good prize. Fellow blogger and/or fellow Pacific Northwest resident - but not unless there is something from the above involved as well (I have a list of PNW bloggers). There's no bio. If you give me no reason to follow you, why would I? There's just a quote or something else that doesn't really tell me anything about the person for a bio. If I see that their tweets are all only links or retweets of other's tweets. If you don't personally say anything about yourself on Twitter EVER, I'm not interested. I do occasionally check in with some app or other that will tell me who I'm following but isn't following me back. I don't expect everyone to follow me back, just like I hope others don't automatically expect me to follow them. However, if I think someone really should have given me a followback (ie, they have no reason to be snobby or we've had interactions) or if my interests have changed, I will do some unfollowing. So what about you? 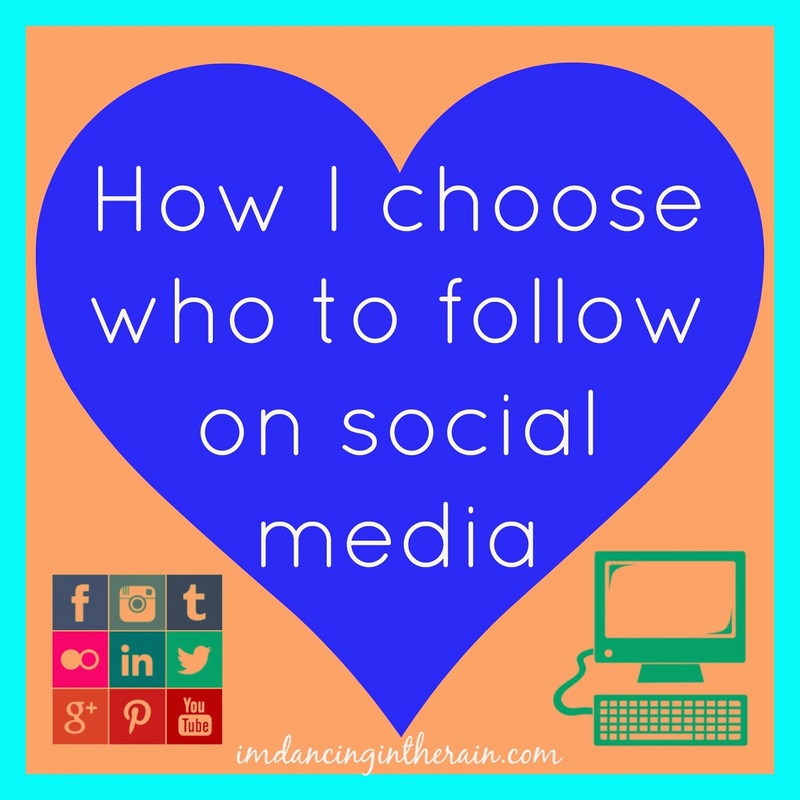 Do you have strict criteria, or do you willingly spread the social media love?